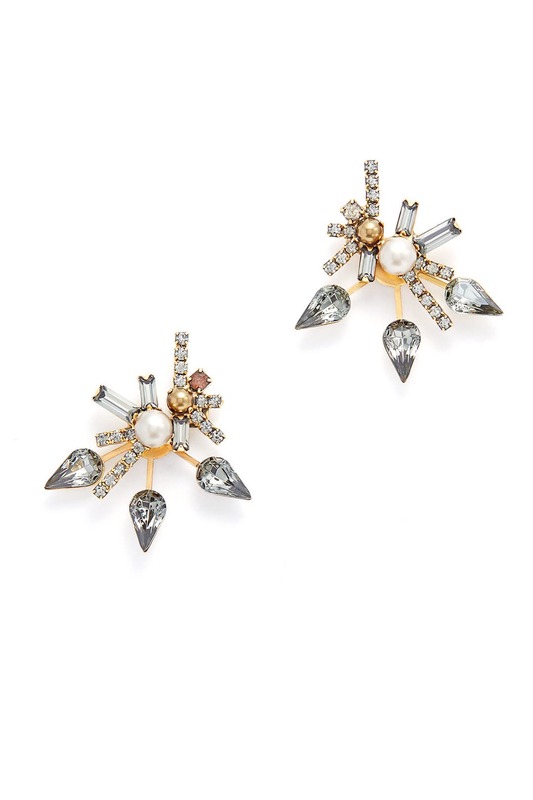 These gem and pearl flares by Elizabeth Cole add a playful pop to any outfit. 24K antique gold plated brass stud earrings with Swarovski crystal and pearl accents. Ear jacket sits behind and belpow the ear. 1" long. These ear jackets are a must rent. At first, it seems tricky - there are three pieces. The front stud, the middle jacket and finally, the back of the earring. I loved the details of this style and how each part made the style different and unique. Not heavy and the perfect size! the most beautiful, unique earrings ever! 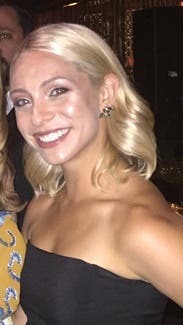 I rented these earrings to go with the Hunter Bell Addison Sheath dress I rented for my cousin's evening cocktail themed wedding. They are true to size, in that they are large enough that part of the earring can kind of climb up your ear. No second pair of earrings are needed for double pierced ears. These earrings have two parts to them. 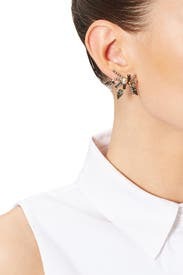 The tear drop trio goes behind the earlobe before the backing goes on, making them a lot like earring jackets which are totally in style right now. I liked the earrings a lot. The only downside, is that they are not as brilliantly sparkly as I had hoped, kind of muted. I don't want to send these back! I wish I'd gotten a picture of these on, but the RTR picture really gives you a good idea of what they look like. I wore them with the Badgley Mischka Kinny dress. They are gorgeous. I had to take one last look (and then another) before putting them back in their box. They are truly unique earrings, and I loved getting to wear them. This was my "mystery bling" and was paired with an LBD. They were really cute. Not something I would have chosen for myself, but I thought they were really cute. A cool vintagey vibe. Perfect ear jacket for my look. Ear Jacks make outsize impact for their ease and wearablity. Rent these! 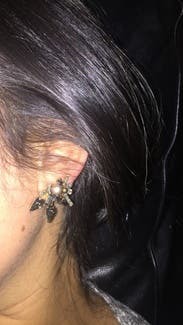 I actually received these ear jacks as Mystery Bling, and was delighted with them. They were an easy weight to wear--I'd have felt comfortable in them for many more hours than I actually wore them--they're a super flattering size, and they *made* my look special. I even wore them to brunch the next day. I got these for an welcome event during my wedding weekend and received many compliments. I liked them so much, I actually just bought myself a pair, since I predict I'll wear them a lot. A little bit heavy, but not uncomfortable, and so unique looking. Ornate without being gaudy. And still in great condition, packaged in individual compartments when they arrived from RTR. I would definitely recommend them. I picked up these earrings in store when another pair didn't fit. The color is much more green in person, so they went well with my green ballgown (pictured without earrings for color reference). 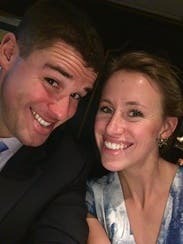 They are also versatile, so they worked with my blue party dress as well (pictured with earrings)! What's more, I got more compliments on these than my dresses. 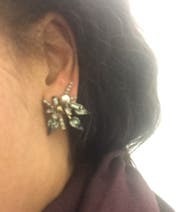 I wouldn't normally choose something like this because I like earrings that hang down, and they're pointy so not as subtle as what I would normally wear, but I loved them. If you're considering it I'd say go for it. Loved these earrings, though the color was slightly off for the outfit I had in mind. Wore them with a black sweater and jeans... Worked out well! I wore these earrings to my anniversary dinner and they really helped to dress up my outfit. These were super comfortable and lightweight. They are very stylish and flattering on the ear. Loved these! Very light and easy to wear. The cuff added a little extra depth. They were the perfect subtle compliment to an elegant gown. I got this as a mystery bling. I love a good surprise!! I think they went well with my dress. Ear jackets are a new trend I knew nothing about! So that was a plus plus. Because they had so many different colors I wasn't sure what necklace to go with. That was the only draw back. But they were beautiful and stayed put all night! I wore this to my work Christmas party and they were a hit. Got so many compliments. 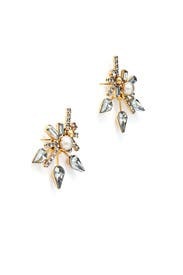 The earrings are beautiful with a modern and edgy look. It does come in 3 pieces so I was just a little worried about that, but all in all they stayed well fixed against my ear and rested on the sides of my face. I would definitely love to rent these pair again. 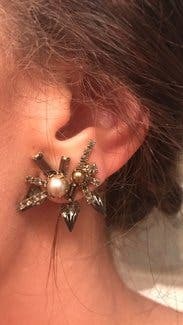 Beautiful ear jackets - I wore them 3 times over the weekend because I loved them so much. One thing to note, they're larger than I expected, but if you're looking for a cool statement piece that will go with a lot, these are them. These earring covered most of my lobes which is fine. I love how the backing had the three gen drops. They matched my outfit very well. The earrings are darker in real life - the rhinestones are more of a smoky teal and the metal is brass. 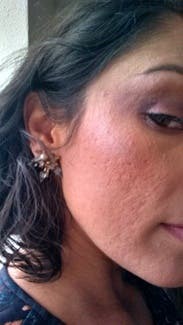 I have very sensitive ears and a nickel allergy but these earrings did not irritate me at all. So pretty!! These are stunning. They are smaller than I thought though and got lost in my hair. Perfect if you intend to wear an updo or have shorter hair. Received tons of compliments! 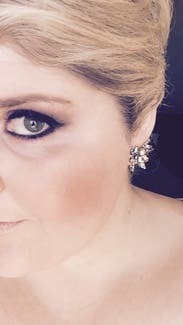 These earrings added the perfect fun touch to my black dress! Gave the perfect amt of glitz! So fun and a great mix between dressy and causal! These were perfect for the dress I was wearing to a wedding! Sometimes hanging earrings are too much and these definitely had the wow factor and were a cross between studs and hanging earrings! I wore these earrings for New Year's eve and received tons of compliments. They were lightweight, comfortable and complimented my dress with a little bit of bling. Perfect way to add personality to a formal. Not heavy at all. Very beautiful. 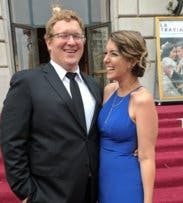 Wore them to a gala and they were gorgeous. Very elegant but interesting. Looked great with my dress and the necklass that RtR recommended. The jackets make them versatile! 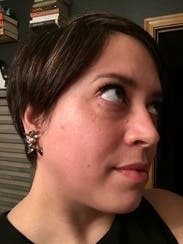 Earrings where part of it goes behind your ears - even with my hair down I got compliments on these! Absolutely obsessed with these earrings. Wish I could have kept them. They are sparkly and unique. I highly recommend these to liven up a simpler dress. They are very eye-catching. 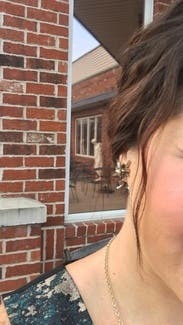 These ear jackets were a funky twist to my classic dress. Loved them and wish I owned them! I rented these to wear with a purple dress for a gala. They were perfect! I received so many conpliments and was sad to return them. They're beautiful and dynamic with three pieces. I hope to find them to purchase. 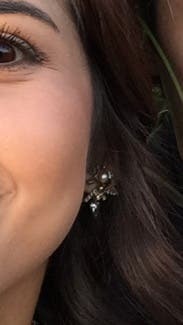 These earrings must have been beautiful at one point in time but due to heavy usage they appeared "used" and the gold plating had already darkened quite a bit. I decided not to wear those, as they did not look very good. I would not rent those again, not worth the money.